To celebrate the 5th anniversary of ZOO and for the company’s fifth group performance its five members present 5 short pieces with the collective title 5. Each of the dancers was given carte blanche to develop a personal project. Up to then the work process had always followed the same pattern, with Thomas Hauert proposing a starting point, an initial challenge, and then inviting the others to contribute creative suggestions. The choreographer points out that research fuelled by the five dancer’s inventiveness and experience opens up perspectives he could never imagine on his own. This time the company took the process a step further. Each of the members had to start from scratch, exploring on their own the fascinating procedure of choosing a starting point among countless possibilities. By shouldering this responsibility the dancers will most probably set the company on a new still largely uncharted course. The autonomy and integrity of each of the 5 pieces is respected they could just as well be shown on their own but they are closely linked by the ties between their creators. What they have in common could be called a democratic approach based on a deep respect for the individual, an inquisitive disposition built on faith in the body’s expressive potential, and a determination to explore thoroughly every aspect of motion. 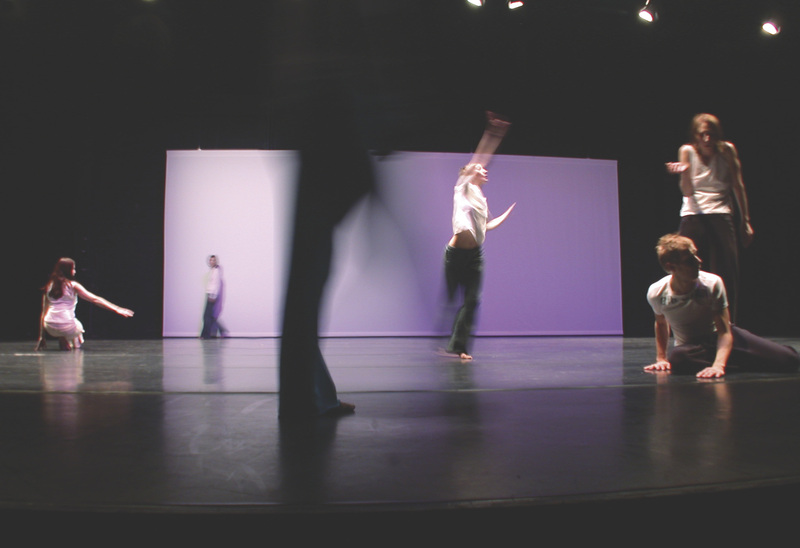 5 is the result of the intensity each dancer has brought to his or her personal investigation. Samantha van Wissen sets herself up as the basis of an examination of movement as the irreducible core of one’s personality and of the changes movement undergoes in the course of a lifetime, along with the evolution of the body and the self. The choreographer confronts different physical states she’s pregnant on video and present live on stage, a few months after her child’s birth and blends them with improvisations based on her vision of several stages in her life: how did I or will I move at this or that stage? Which specific characteristics does each age bring? From the movements made inside someone else’s body, through spontaneous and unchecked motion as a child, never restrained by the rules of communication, until the time when the possibilities shift and the inner frames falter literally and metaphorically. Varying a phrase from her choreography by projecting it on several times of her life, Samantha van Wissen uses her own body to investigate life, evolution and identity. Part of ZOO’s work involves looking for ways to organise a group, to blend its members into a whole while ensuring they keep a great deal of creative liberty. This time Thomas Hauert chose a piece of music as his starting point, a choral song by Anton Bruckner. The physical and sensory experience of singing the Bruckner Motets’ dynamics, harmonies, melodies and counterpoint served as the score for a group improvisation. The music is never played while the dancers are on stage; they have assimilated the experience of singing the piece together and now follow their inner voice, dancing the Bruckner Motet, rather then dancing to it. On this framework was latched another one made up of a variety of rules of play: spatial connections, lines, curves and orbits, instructions concerning dynamics or timing, contact, interdependence and the transfer of energy, spatial architecture.All these aspects of movement were added to the common tool chest. Each dancer is free to use this syntax but also to put into action all his or her personal knowledge. Basically Common Senses reflects the contrast between convention and invention, order and chaos, rules and liberty. The possibility of a ‘common sense’ presupposes a shared culture, open to interpretation and to transformation. And the ‘senses’ or ‘logics’ we have ‘in common’ with others allow us to understand them, to communicate with them, insofar as we can interpret their experience. Inside a given culture diversity and evolution are a product of the desire and the pleasure to invent and create rather than of the wish to recreate. Common Senses is mainly founded on the instinctive interpretation of the interaction between human beings these ten experienced, inquisitive and creative dancers. The pleasure someone takes in creating produces a destabilising sense of chaos, but also the tremendous beauty of liberty. Mark Lorimer’s contribution to 5 was initially a duo with Chrysa Parkinson, which he later opened up to include the other members of ZOO. At first his research centred on the ways two performers can dance together while being constantly connected but without ever moving in unison. Later the emphasis switched to a mirrored repetition of short loops of material. Starting with the first scene, where a double mirror arrangement causes a fascinating development the two dancer’s movements stay closely linked without ever overlapping the concept is expanded through several complex types of symmetry: a mirrored body is bisected by a diagonal or vertical axis, the dancers pass through or bump into an imaginary mirror, there\‘s a swivelling mirror, a magnifying mirror amplifies their movements. The score heard in counterpoint includes the inverted melody of a music box, a small case from which a ballerina emerges to dance ceaselessly in front of a mirror. When Sara Ludi heard she was to create a personal piece, just like the other ZOO members, she first yielded to the temptation to simply reproduce the company’s usual collective creation routine. But having understood that this method didn’t suit her at this time she reverted to personal work and started to improvise on her own, investigating several possibilities. She finally decided to study in detail the application of retrograde movement to improvisation. Usually retrogression consists in constructing a phrase and then reversing it, but here the movement instantly becomes the reverse of non-existent phrases. This ‘reverse mode’, developed at several levels, induces an intense and productive state of tension. As in the other pieces the main objective is not to recreate an image that of retrograde motion, in this case but to generate movements with specific characteristics and dynamics. With the support of Ministerie van de Vlaamse Gemeenschap – Cultuur, Vlaamse Gemeenschapscommissie, Pro-Helvetia, Ein Kulturengagement des Lotteriefonds des Kantons Solothurn and SACD.